It really started with the famine that wasn't. There was plenty of food for export, but the poor depended on potatoes for their daily existence. The potato blight reduced the population as an estimated two million died and two million emigrated--most of them to America. It is a heartbreaking, yet inspiring story that Coffey, managing editor of Publishers Weekly, and Golway, a columnist for the New York Observer, present in this magnificently illustrated book. Golway sets the stage by describing the misery of the famine and the ""coffin"" ships, and focusing on one Patrick Kennedy of County Wexford, whose great-grandson would become the first Irish Catholic president of the United States in 1960. Singer Larry Kirwan of the band Black 47--named for the worst year of the famine, 1847--tells how the horror of the famine was imprinted on his soul by his grandfather; bestselling writer Frank McCourt, who almost starved as a child, remembers his astonishment at the amount of wasted food he would see when he emigrated back to the U.S.; and writer Peter Quinn reminds us why the Irish kept close to the cities: ""a place safe from the ravages of Prohibition, Fundamentalism, and small-town Republicanism."" A former priest, writer James Carroll looks at the importance of the local parish, and Newsday columnist Dennis Duggan takes a peak inside the McManus Democratic Club in Manhattan's Hell's Kitchen, which still administers to the new immigrants. Newsman-novelist Pete Hamill explains how Belfast immigrants became Americans, while filmmaker Terry George learns about baseball--and America--from Hamill's brother, screenwriter John. Actor Jason Robards reminds us how the writings of Eugene O'Neill still haunt us. Coffey and Golway weave stories about rogues, priests, politicians, poets, gangsters, nuns, ballplayers, union organizers, writers and plain old working-stiffs into a beautiful emerald tapestry that celebrates Irish achievement and success, but remembers those who made the crossing for the want of a potato. Major ad/promo. 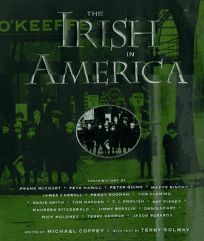 (Oct.) FYI: The Irish in America will also serve as a companion volume to the forthcoming PBS documentary series, airing in January.